CUT TO: The interior of Scott's office. This is my Deputy Commissioner, Kevin Weiberg; Mr. Dodds. He's the one who arranged this whole thing through your man Worley. I trust these men with my life, Mr. Dodds. If I were to ask them to leave, it would be an insult. The Pac-12 conference has done very well on the West Coast. You own, or, you control, six regional TV networks -- one national. The contracts were negotiated with the cable operators, so there is no problem with distribution. Now, my sources tell me that -- you plan to make a move against the Big XII. They tell me within a week -- you're gonna move Beebe out. That's quite an expansion. However it will leave with one little technical problem. Ahh -- The Longhorn Network will still be in the University of Texas' name. Worley is a good man. Yeah, well let's cut out the bulls**t. I don't want to spend any more time here than I have to. You can have Texas in the Pac-16, the price is we get to keep the Longhorn Network. Plus a monthly payment of 20% of the gross -- of all conference TV revenue. Now the rest of the conference schools have agreed to pool all media rights and divide the revenues equally, am I right? Now why would I ever consider giving you more than that? Because I intend to squeeze you. I don't like your kind of people. I don't like to see you come out to this clean country in your $300 haircuts -- dressed up in those polo shirts - and try to pass yourselves off as decent Americans. I'll do business with you, but the fact is, I despise your masquerade -- the dishonest way you pose yourself. Yourself, and your whole f***ing conference. Mr. Dodds - we're both part of the same hypocrisy. But never think it applies to my conference. All right, all right -- some people have to play little games. You play yours. So lets just say that you'll give Texas a larger share because it is in your interest to have us in your conference. But I want your answer by noon tomorrow. And one more thing: don't you contact me again -- ever. From now on you deal with Worley. Uh, Mr. Dodds -- you can have my answer now if you like. My offer is this -- nothing. Not even the fee for terminating the Longhorn Network, which I would appreciate if you would put up personally. In the build up to the new football season, I will be naming my All-time ASU team. I will announce the team in a series of articles, position-by-position. Since I started this process a few years ago, I have received some great feedback from fans, and got in touch with some past players who provided invaluable insight. Many of the selections proved far more difficult than I ever anticipated. In the end, I had to make some tough decisions, so if I did not pick your favorite player that does not mean that I ignored your input. (1) This will be a true team, with the right number of players at each position. That means one halfback and one fullback for example. I'm not going to cheat like the NFL did when they named four quarterbacks to their 75th Anniversary All-Time team. This defeats the entire purpose: it's easy to say that Baugh, Graham, Montana and Unitas were all great; it's a lot harder to say which of them was the very best. (2) The defense will be a 4-3. During much of the Kush era the defense was a 5-2, which is effectively a 3-4 in modern parlance. In the 80's and 90's the 4-3 was the dominant formation. (3) Only players from the WAC era and beyond will be considered (that's 1962 onwards). It is almost impossible to fairly evaluate players from the Border Conference days. (4) Players will be evaluated based on their college career, not their pro performance. 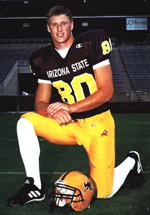 For example, Jerry Smith was a great tight end for the Redskins, but it's his time at ASU that counts. (5) Players will be judged at the position they played in college, not the pros, so Darren Woodson gets judged as an outside linebacker, not a safety. (6) Football performance will also outweigh off-field contributions or all-around popularity. Nathan LaDuke was a fan favorite on an otherwise horrible team, but he wasn't necessarily one of the two best safeties in ASU history. Charley Taylor's historic contribution in breaking the color barrier for the Redskins doesn't influence his inclusion on this team. (7) Extended careers will carry more weight. So while Derrick Rodgers' performance in '96 was one of the great single seasons in Sun Devil history, it's not enough for him to make the team. (8) Individual honors carry a lot of weight, but do not make selections automatic. Multiple All-Americas (Woody Green, Mike Richardson and David Fulcher) and Hall of Fame inductees (Mike Haynes, John Jefferson, Randall McDaniel, Ron Pritchard, Pat Tillman and Danny White) are virtual locks. Most importantly, this is "my" team. I feel comfortable that each of the selections I have made are the best at their respective positions, but in most cases there were at least two or three other candidates that deserved careful consideration. As reported by the Arizona Republic, ASU is considering a move to the Chicago Cubs' new stadium in Mesa in 2014. Predictably, this has produced a strong response. I was expecting 95% of the feedback to be negative, but right now it's tracking more as a 50-50 split. You can follow the discussion on the Sun Devil Message Board and Sparky's Pigskin Forum. As I posted, I'm really torn. I'd much prefer to keep all sports on campus, but the opportunity to play in a state-of-the-art stadium for free may be too good to pass up.